Finally got NOD #4 published on Lulu. 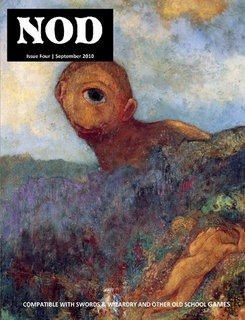 In this issue of NOD: A sandbox hexcrawl with more than 200 encounters, 50 new monsters inspired by European folklore, a pantheon of deities inspired by the Dacians and Thracians and two dungeon adventures – one for low-level parties and the other for mid-level parties. Plus – the next installment of our serialization of George MacDonald’s fantasy classic, Phantastes. Use the coupon code “AUTUMN” to get 10% off – I’ve entered the September sales contest. Also – I have my outline for Mystery Men! on the “Free Downloads” page of my blog. Its in google docs, and this is where I’ll be writing the game. I probably won’t touch the outline for at least a couple months while I finish PARS FORTUNA and prepare NOD #5 for sale, but I’ll hit it hard around NOV/DEC. In the meantime, feel free to send me ideas, suggestions and criticisms. I just downloaded this and holey moley! The layout, art and production values are fantastic! Thanks guys! I hope you get some use out of it. I just picked up NOD #2-#4; they look great. Is there a separate download for the cover page of NOD #4? It is not present in the pdf from lulu. I'll have to fix that – thanks for the notice. I'll put it up as a download tomorrow on this site and fix the file on Lulu as well. Issue Four has arrived and I have to say “the Medieval Bestiary” alone is worth the cover price. Another incredible issue, thank you for all your hard work! Thanks! I still need to fix that cover problem on the e-book – today for sure. I just purchased every issue of NOD. I seem to be overlooking the scale for the hex maps. Where can it be found? To be perfectly honest, now that you mention it I don't think I've ever put that rather useful information in the magazine. Dang. I assume a scale of five or six miles, whichever works better with the movement rates you use.